1. Do I have to pay extra to watch the theatre performances? No, all theatre performances during the day are included in the admission, as is a visit to ‘Vi på Saltkråkan’ (Sea Crow Island, in Sedish). 2. We won’t arrive until 2 pm and the park closes at 6 pm, can we buy half-day tickets? 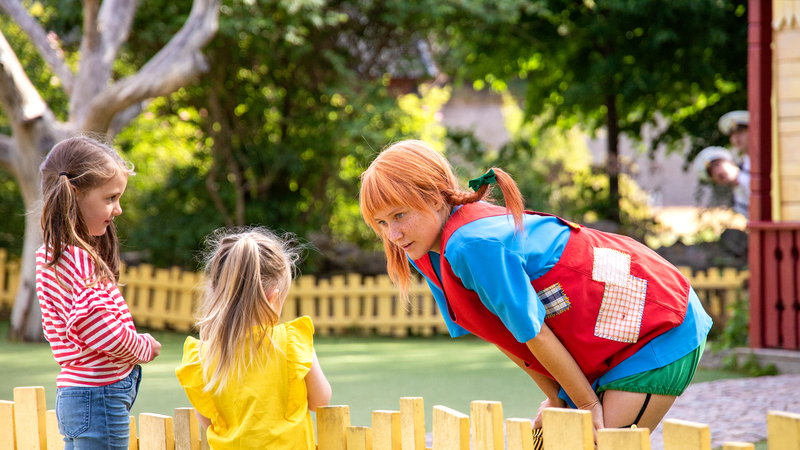 Astrid Lindgren’s World only sells full-day tickets. 3. We are arriving by train at 10 am and are going to stay in a cottage. What should we do with our luggage as we can’t access our cottage until 3:30 pm? The luggage can be left in the Information inside the entrance. There is also and storage area for luggage and valuables. 4. Can I go out to the car park and back in without having to pay again? Yes absolutely. Talk to the staff in the Information and they will help you get a ticket for readmission. 5. Are dogs allowed in the park? Yes, as long as they are on a lead and don’t disturb the other guests. Dogs are not welcome in the buildings or in the outdoor seating of the restaurants however, in consideration of guests with allergies. Many of our performances include animals so it may be a good idea not to sit right at the front in the audience. 6. If I’m in the park and have bought a one-day ticket but change my mind and want to go one more day, can the ticket be upgraded? Yes, between 3 pm and 4:30 pm you can take your tickets and receipt to the ticket booth outside the entrance. Then you can upgrade your ticket and pay the difference. 7. Is the whole park accessible by wheelchair? As good as all the park is accessible to wheelchair users. To see where you can go by wheelchair, read our access information on Equality’s website. 8. Are there carts for hire? Yes, carts can be hired at the Information inside the entrance. The carts cost 40 SEK/day. 9. Are all the performances outdoors and what happens in case of bad weather? All theatre performances are outdoors. In the event of heavy rainfall, some performances may be delayed until the weather improves or, in exceptional cases, cancelled. But you can always meet the characters at the times displayed. 10. Are any of the performances translated into other languages, for example ? All the performances in the park are in Swedish only. Most of the stories are well-known by the children, so the language is rarely a problem. Most performances also include music and singing, especially the performances on the Small Stage on School Street. 11. My child needs a personal carer. Can I go in free as a personal carer? Yes, if you as a parent are employed as a personal carer and can show a valid personal carer certificate. A valid personal carer certificate is issued with the personal details of both the personal carer and the disabled person. If there is a special certificate on which a doctor has added that the person concerned needs constant supervision for activities such as park visits, we can give free personal carer admission to a parent without a certificate. The personal carer’s free ticket is collected from the ticket booths outside the entrance. 12. Are there name wristbands for children? Yes, inside and outside the entrance there are wristbands on which you can write your child’s name and your telephone number. 13. Are there hearing loops? Yes, the Information has a number of portable hearing loops in Swedish that are to borrow if you have impaired hearing. The system is wireless with a receiver and a personal hearing loop that you wear around your neck, or alternatively in a pair of headphones. You then choose on the receiver which theatre setting you want to listen to. If, for example, you want to listen to the performance ‘Sjörövarfabbes jänta’ with Pippi Longstocking in Villekulla Cottage you have to be in that setting to get good reception. 14. Are there rooms for breastfeeding babies in the park? There is a breastfeeding room inside the entrance. It also has a baby changing table. 15. Can I take a pushchair everywhere in the park? Yes, except for the spectator seats for the theatre settings, but there are places where you can park your pushchair or cart. Don’t leave valuables in parked pushchairs and carts. 16. What happens to lost items? Ask about lost items in the Information by the entrance. We collect all items we find there. If the item has not yet been found, we will take the details and telephone number of the guest, whereby the Information will contact you when the item is found. 17. What happens if I lose my child? If you should lose your child, the staff will be happy to help you look for him or her. The staff will take your name, telephone number and details about the child and then make a general call on the communication radio so that all the staff can help you look. We look for children quickly and efficiently. 18. Are there barbecues inside the park and are they lit all day? There are several barbecues in the park and their locations are shown on the map. There is barbecue charcoal and lighting fuel by each one so you can light it yourself. 19. Do you have an app? Yes, we have produced an app and it has the latest information on what is happening in the park. The app is a good tool that be used to plan and prepare for your visit already from home. 20. Is there food for people with allergies (of different kinds)? We have several options for people with allergies. More information on what we offer can be found here. You can of course also ask the staff at the food outlets.